You are going to Watch RWBY Volume 1 Episode 4 online free episodes with HQ / high quality. Stream cartoons RWBY Episode 4 Online Yang is walking through the forest and encounters two bear-like Grimm, Ursas. She defeats one, while Blake eliminates the other. 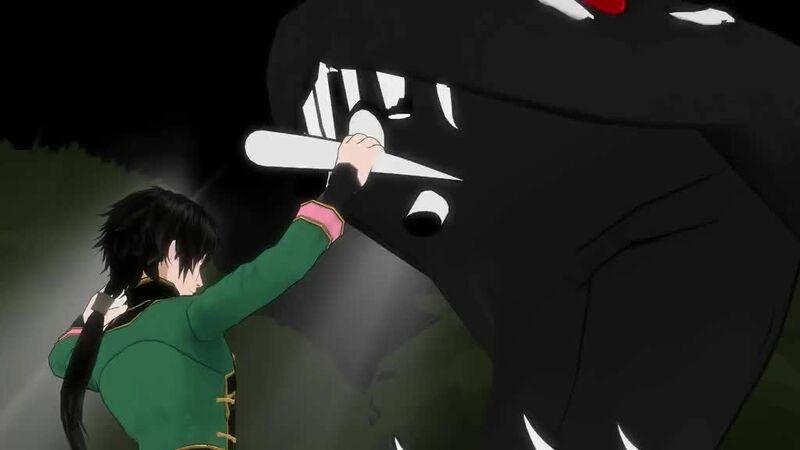 Elsewhere, Weiss is also fighting the Grimm surrounding her, when Ruby gets in front of an attack. Weiss redirects her strike at a tree, which sets the forest on fire and forces Weiss and Ruby to retreat. After escaping, they begin arguing over how each of them handled the fight. Meanwhile, Pyrrha teaches Jaune about using his Aura, the manifestation of his soul, for protection. She explains the nature of Auras and the Grimm to Jaune and helps him unlock his Aura. During her explanation, Ren is shown battling a large snake-type Grimm, a King Taijitu, demonstrating the power of his Aura. Eventually, Ren kills the King Taijitu and its partner. After the fight, Nora appears beside him, hanging upside-down from a branch. Glynda and Ozpin monitor the students as they fight through the forest. Glynda expresses doubt about Jaune’s ability and the effectiveness of Ren and Nora as a pair, while Ozpin focuses on Ruby and Weiss with trepidation. A displeased Weiss is pacing, unclear of the forest temple’s location, and the two argue again. Elsewhere, Yang and Blake manage to locate the temple and find several chess pieces, which appear to be the relics. Meanwhile, Jaune takes Pyrrha through a cave he thinks is the temple and they encounter a giant scorpion Grimm, a Deathstalker, which bursts out of the cave and flings Jaune through the air. Back at the temple, Ruby is falling through the air towards Blake and Yang.